This movie guide will help your students get the most out of this powerful movie. .This movie guide comes with an answer key. Ready to print and ready to use!This movie guide also comes with a song analysis sheet for Don McLean's song title "American Pie." This is a fill-in-the-blank activity for the Los Lobos version of La Bamba. Great for any level, particularly lower level because there are basic words (bailar, soy, marinero...) Includes answer key and suggested activities as well as You Tube links to various versions of the song. 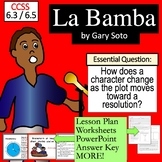 This unit is a complete analysis of Gary Soto's short story "La Bamba". It contains the text of the story, vocabulary, a plot chart, figurative language, conflict analysis, and theme analysis. It is Common Core aligned and contains a final assessment. Teacher answer keys are included. 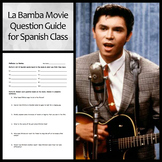 This is a quiz with answer key to assess students' comprehension of the story, "La Bamba" by Gary Soto. 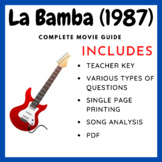 Lyric sorting activity, a short history about the song, and a "Correct the lyric" activity for the song La Bamba. This reading contract uses Bloom's Taxonomy to deepen students thinking with four fun, engaging activities and projects that go along with "La Bamba."